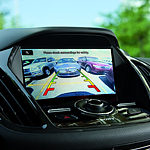 Ford Co-Pilot360 is one of the most advanced suites of driver-assist technologies available anywhere. We here at Sheehy Ford of Springfield think the entire suite is outstanding, but here are two safety tech features we love to share with others. The Lane Keeping System supports vigilant driving with three separate and related technologies. Steering wheel vibration alerts you if you veer too close to lane markings, while steering torque helps you get back to the center of your lane. A driver alert system issues visual and audio warnings if you stray outside of normal driving patterns that are constantly monitored by forward-looking camera. Automatic Emergency Braking (AEB) begins with pre-collision assist and pedestrian detection. Pre-collision assist delivers warning flashes and alert sounds if a vehicle or pedestrian cross in front of your advancing Ford. If you're advancing and fail to respond to the warning flashes and alert sounds, AEB deploys to prevent an unfortunate collision. Ford Co-Pilot360 is scheduled to be standard on at least 90 percent of new Ford models by the end of 2019.